We've redesigned our Extended Eye Relief scope base especially for the T/C Encore Pro Hunter 20 ga Slug and Turkey barrels. 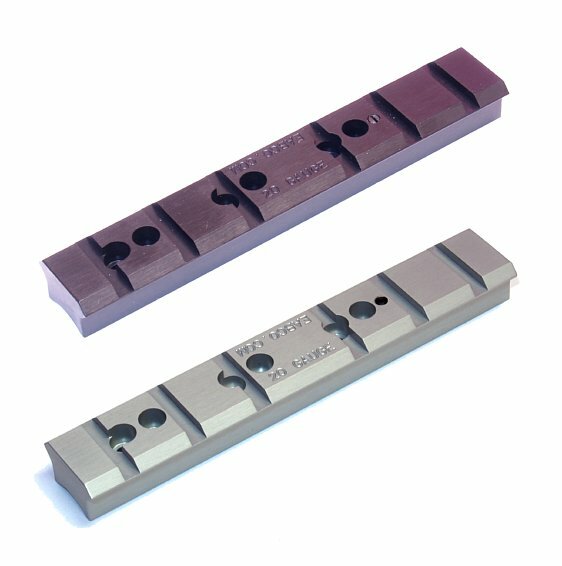 Based on our World Famous 6-Screw Keylock design, this scope mount is precision machined for straightness and rigidity... The "Must Have" ingredients for accuracy and consistency. This mount is specially dimensioned to accommodate the shallow screw holes of T/C Encore Pro Hunter 20 ga barrels. World famous for toughness, our Keylock bases have been made EVEN TOUGHER... The flat tops give full width slots for locking into rings with more surface area. Fits the standard 4-Screw T/C Encore Pro Hunter pre-tapped holes with the option of 6-Screw mounting for the hardest recoiling ammunition. Our price includes free 6-Screw installation when purchased with an Encore barrel. Installations are scheduled for Thursdays. - Fits standard 4-screw pre-tapped scope mounting holes on Thompson Center Encore and Pro Hunter 20 gauge slug and turkey barrels. Optional drill and tap 6-screw installation included free when you send in your barrel or order a new barrel.